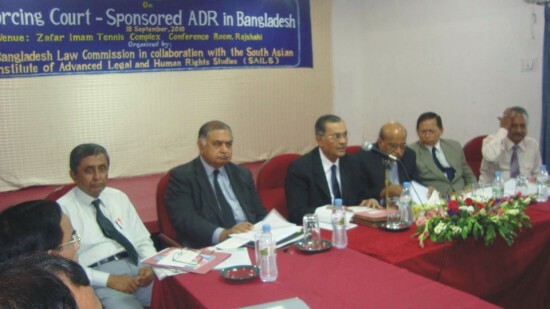 On September 18, 2010 Bangladesh Law Commission in collaboration with the South Asian Institute of Advanced Legal and Human Rights Studies (SAILS) arranged a day long seminar in Rajshahi on 'Enforcing Court Sponsored ADR in Bangladesh'. The seminar was presided over by Mr. Justice Mohammad Abdur Rashid, Chairman of Bangladesh Law Commission. Mr. Justice Muzammel Hossain, judge of the Appellate Division was the Chief Guest; Mr. Justice SK Sinha, judge of the Appellate Division and Dr. Kamal Hossain, Chairperson of SAILS graced the seminar as Guest of Honor. Professor Dr. M. Shah Alam and Mr. Sunil Chandra Paul both members of the Law Commission attended as key note speaker in different sessions. Judicial officers of the Rajshahi District court, members of the Rajshahi District Bar Association and Law teachers of the Rajshahi University participated in the seminar. At the very beginning Dr. Shah Alam portrayed the seminar as an inquest to meet challenges of implementation of the court sponsored ADR in Bangladesh. He solicited recommendations from all quarters to make the ADR a success. Mr. Sunil Chandra Paul in his speech identified dearth of awareness and unwillingness of the lawyers as root cause for failure of ADR. He proposed establishment of separate ADR courts under supervision of joint district judges and insisted upon activation of village courts and imposition of compensatory cost for false and frivolous litigations. District judge of Rajshahi suggested amendment of section 89A of the CPC and enactment of new Rules to implement ADR. To check baseless cases other judges of the civil courts emphasized on maintainability hearing at the initial stage of the litigation. CMM and CJM of Rajshahi recommended increasing the opportunity of ADR in criminal cases by widening the scope of section 345 of the CrPC. On the contrary Mr. Muzammel Hossain, J and Mr. SK Sinha, J expressed their concern as widening the ambit of compoundable offences may have adverse effect on the public peace and tranquility. Judicial officers of Rajshahi vindicated their grievance for resource constraint and urge the Appellate Division Judges to take measures to provide required court rooms, stenographers and conference room for ADR. Mr. Muzammel Hossain, J assured them of the Government policy for strengthening judicial capacity by way of infrastructure development and providing adequate resources. His Lordship also suggested the district magistrate to setup court room in available unused building. His Lordship also encouraged round the year mobile court drive to impede drug trafficking and contamination of foods. Justice Hossain was optimist in stating that, success of the ADR will widen the scope of the legal profession and there is every possibility of starting of an ADR based legal profession. President and Secretary of the Rajshahi District Bar Association agreed with the suggestions forwarded by the key note speakers and expressed their commitment for implementation of ADR. They proposed combined training of the judicial officers and lawyers by the Judicial Administration Training Institute or by the Bangladesh Bar Council to ease implementation of ADR. As the members of the Bar expressed their concern as to the High Court Division's foggy directions in anticipatory bail petitions, Mr. Muzammel Hossain, J assured them that the recent decision of the Appellate Division will eliminate the misty as the High Court Division's jurisdiction will be limited in 'Yes' or 'No' in entertaining anticipatory bail petition. As the President of the Rajshahi Bar emphasized on decentralization of the High Court Division benches to reduce backlog of cases Mr. Muzammel Hossain, J corroborated him without any assurance. Dean of Law of University of Rajshahi expressed his commitment to insert in the academic syllabus the issues of civil and criminal ADR, probation of offenders and plea bargaining in criminal cases. Professor Dr. M. Shah Alam informed the audience about the Bangladesh Law Commission's policy for ADR. Major policy decisions are- i. to amend CPC ii. to amend CrPC iii. petty disputes to be resolved at grassroots iv. establishment of ADR training institute and allocation of fund v. court procedures and records should be made computerized vi. leadership of the Supreme Court for implementation of ADR policy vii. national policy for the judiciary and viii. awareness building. In his speech Mr. SK Sinha, J considered ADR a useful mechanism to reduce delay in dispensation of justice. His Lordship shared his experience of ADR in Korea and Australia and enlightened the audience with the success rate of ADR in different countries of the world. His Lordship expressed dissatisfaction as to the non utilization of court hours, as his experience of court inspection in different jurisdiction revealed that many judicial officers remain unengaged in the second half of the day. Justice Sinha criticized unnecessary adjournments and too many holiday vacations, and shared the proposal of the Supreme Court to reduce the off days. To ease delay by facilitating ADR, his lordship proposed amongst others: i. change in mindset of lawyers and judicial officers; ii. nation wide awareness campaign among stake holders; iii. training in ADR should be available to the law graduate; iv. lawyers succeeded in settling a dispute by way of ADR may be paid by the Government and v. petty cases should be finalized in district courts. Dr. Kamal Hossain in his speech urged the combined effort of the Bar and Bench to make the ADR a success. He warned that public confidence on the administration of justice is seriously shaken due to prolonged delay in getting justice in which both the Bar and Bench can not avoid their responsibility. This legal luminary acknowledged the need for decentralization of the High Court Division and proposed circuit bench of the HCD to be held in different parts of the country to mitigate the miseries of the justice seekers. He solicited the Bar and Bench to maintain ethics and dignity of profession and to regain public confidence. In his vote of thanks the secretary of the law commission expressed his gratitude to all participants, to the volunteers and specially thanked Abu Md. Amimul Ehsan CJM and Md. Alamgir JM but for whose efforts the arrangement would not have been possible. The writer is Lecturer, Department of Law, University of Rajshahi.